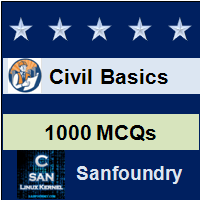 This set of Basic Civil Engineering Multiple Choice Questions & Answers (MCQs) focuses on “Qualities of Good Brick”. 1. What is the recommended size of a brick? Explanation: Bureau of Indian Standards recommends the size of a standard brick to be 19x9x9cm. 20x10x10cm is the size of the brick including mortar. 2. A good brick should not absorb more than what percent of water when soaked? Explanation: As per IS codes when a brick is soaked in water for 24 hours, it should not absorb more than 15% of its dry weight. 3. Which of the following bricks is not preferred? Explanation: In clamp burning, bricks are not burnt uniformly. This results in a non-uniform surface, colour of bricks, which cannot be used for high end works. 4. Which of the below is used to sound proof bricks? Explanation: Terracotta is an acoustic material. It will absorb the sound waves and render the brick sound proof. Explanation: As per IS codes, number of bricks are tested in CTM and average is taken. It should be a minimum of 3.5 N/mm2. Explanation: A good brick should be able to withstand rough handling and transporting. If it breaks into pieces, then it cannot be trusted for use for high strength requirements. 7. What should be observed when a brick is broken? Explanation: Brick should have uniform red coloured and homogeneous strata. It should not have any visible pores. 8. Which of the following ranges of dimensions of a good quality brick is correct? Explanation: The width and height of brick should be in the range of 174-186cm. The weight of 1m3 of brick earth is 18kN. Hence, the average weight of brick should be in the range 30-35N.